Chrichton's World: Review Cross (2011): What were they thinking when they made this? Seriously! 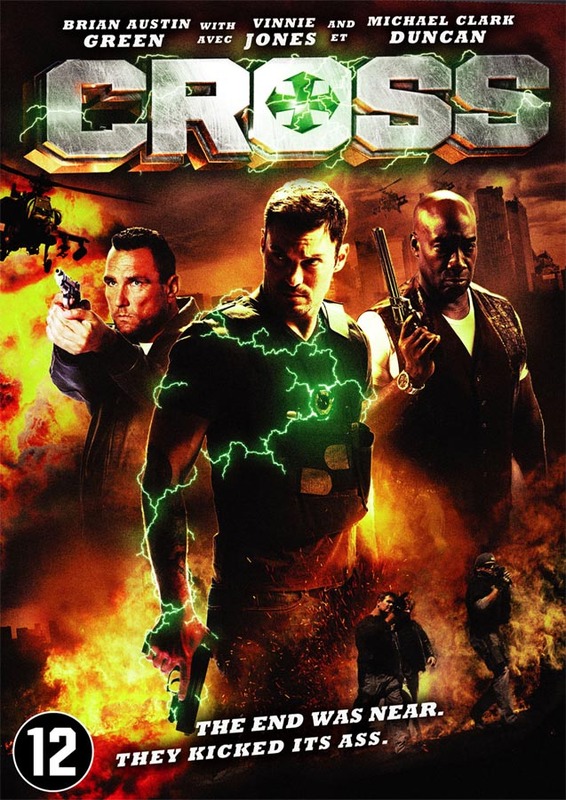 Review Cross (2011): What were they thinking when they made this? Seriously! Naturally I had no illusions of Cross being any good. I assumed it was bad. But I wanted to find out how bad. I mean sometimes a film like this can be misunderstood and that there is a sense of humour to the film that has not come across properly. Well, to put it bluntly Cross is all kinds of bad and no mistake is made whatsoever. The general consensus is right on this one and actually I think most of them have not been harsh enough. Because seriously what the hell were they going for here? Was this truly an attempt to bring us a new super hero? But why make him part of a team full of soldiers and sharpshooters? Doesn't that almost negate whatever he can bring to the table? They guy has a necklace with a cross on that grants him powers. He is practically invincible with it on and can blast green energy. But does he make use of these powers? Very rarely. He rather uses his precious guns. If it were me I would combine my powers and the guns like (original) Dante did in Devil May Cry. Far more effective and super cool. Then again we are talking about a character played by Brian Austin Green who is not even bothering to give this film his best. Actually most of the cast are incredibly lazy into making this more than what is offered. Let me mention some names shall I. Michael Clarke Duncan, Vinnie Jones, Tom Sizemore, Danny Trejo, Robert Carradine, Jake Busey and C. Thomas Howell. All of them are wasted in their roles. Danny Trejo got it the worst. He is in this film for like three seconds. I wonder how much he got paid for that? Anyway the plot is completely unimaginative and predictable as hell. And even if you were trying to make sense of it there is no point since logic has been thrown out of the door. Vinnie Jones plays Gunnar, apparently a Viking who is cursed and is immortal. He has one wish and that is to die. No motivation given other than he is fed up being an immortal. Wow, compelling stuff right there! Don't let me get into how he wants to accomplish this since it is totally ridiculous. To be honest I would have embraced the ludicrousness if the movie and the cast would not have take things so seriously. But they do. And it is very awkward and painful to watch. Jake Busey (son of Gary Busey) is trying to infuse the events with some comedy. Too bad he is the only one to do so resulting in big contrast to the rest of the cast. Director Patrick Durham doesn't seem to care that much about the acting and is something I can appreciate if other elements in the film were top notch. Like for example the action. If you judge this on the first ten minutes then you might get the impression that it's quite decent. However this is one of three big action sequences (and two very small ones) in total. Everything in between is total filler. I kid you not. Nothing remotely interesting happens in the non action scenes and makes you wonder if there really was a plot to this film. Ok, maybe one scene in the beginning where a victim is telling Sizemore what happened to her could be seen as interesting. If not for the fact that nothing is done with it. Cop Sizemore can't stand vigilantes and you would think it would offer some nice dynamics between him and Brian Austin Green. Guess what? They never meet or interact. So what is the point? It's my guess they were going for a Daredevil / Ben Urich sub plot. Then halfway through they forgot or didn't care anymore and never paid attention to it. But sorry I digress. The action in case you were wondering is average to decent. Nothing to get excited about. Long story short. Don't bother with this film. It's a complete waste of your time. Want to hear something crazy though? Apparently there is a sequel in the works. Go figure!